It’s Time to Get Your Bike Ready for Spring Riding! Have you been putting off riding your bike until Spring or Summer hits? Well, wait no longer! We are a full service bicycle repair shop! Jax Bicycle Centers are full service bicycle repair shops located in Orange County, Los Angeles and Riverside. We are trained to repair or service any bicycle make or model. Whether it’s a minor tune-up or a major overhaul, you can count on us to do the job right the first time, every time. Need a service or repair that is not listed? No problem, give us a call or stop by any of our 8 locations and we would be happy to provide you with a free estimate! We work on thousands of bikes a year. The number one repair is flat tires. 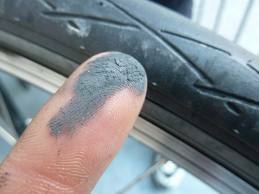 Nearly every rider has experienced the annoying flat tire. One of the other common repairs we perform on bicycles are brake adjustments. Brakes squeaking, rubbing, too tight, too loose, etc. For most, brakes are the most important safety feature on the bicycle. So here are some tips to enhance your braking performance. Glazed, hardened, dirty, or misaligned brake pads account for nearly all loss of braking power problems. Keep the surface of your brake pads clean and fresh by using sandpaper or steel wool to scuff away any debris, and hardened glaze. Check the alignment. The pad should be toed in about 1/8″ to first make contact with the rim at it’s front half. Additionally, the pad should contact the center of the rim. The pad should never rub the tire or hang off the rim. In general, clean and inspect your brake pads every month. Brake pads are inexpensive and relatively easy to replace. You’ll be amazed at the difference new brake pads make. Regularly clean your rims with a Multi Bike Degreaser. Your pads will work better and last longer.